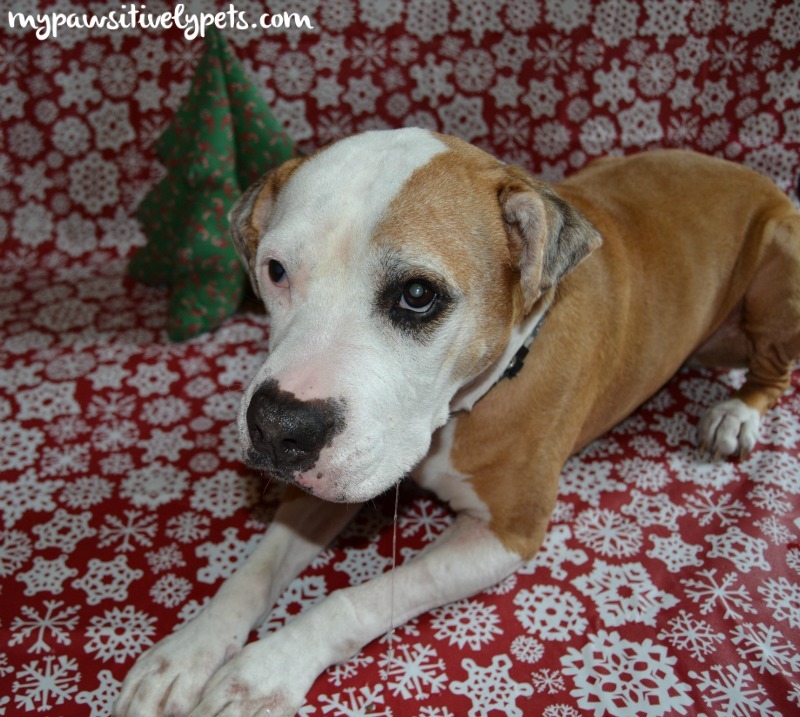 This post is sponsored by Jones Natural Chews and BlogPaws Professional Blogger Network. I am being compensated to help spread the word about Jones Natural Chews, but Pawsitively Pets only shares information we feel is relevant to our readers. Each year, Shiner gets a special Christmas present. I don't normally spend tons of money and try to keep it simple for the most part. Usually, she gets a stuffy plush to de-fluff and a tasty treat or two. This year for her treat, I am giving her Jones Natural Chews as a stocking stuffer. Jones Natural Chews sent us a few of their all natural dog treats to try out. They have a lot of excellent dog chews that would go great in any dog's stocking. Shiner's mouth was drooling before I even opened anything up for her to try! Before I go into detail about each stocking stuffer, let me tell you a little bit about Jones Natural Chews and why I like their dog chews. They are a family run business, dedicated to making the best dog treats. Jones Natural Chews are 100% all natural with no artificial ingredients and 100% grown and made in the USA, certified. Their dog chews are primarily single ingredients, including bones. These dog chews from Jones Natural Chews are making my mouth water! Ready to see what is in Shiner's stocking that has her drooling so much? Let me show you! This stocking is filled with five different Jones Natural Chews dog chews. 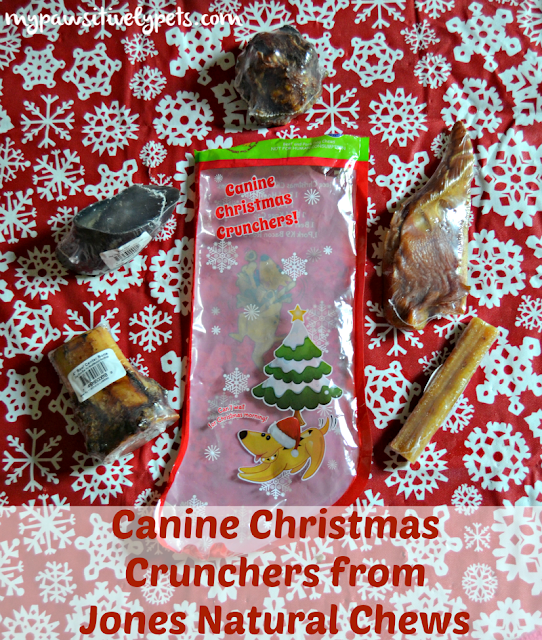 The Canine Christmas Crunchers stocking is an easy holiday gift for small to medium sized dogs. This might be Shiner's favorite item she received from Jones Natural Chews because it has a good variety of dog chews included. These are what REALLY had Shiner drooling. A lot. Rocky's Rollers are a meaty sausage link that measure 7"-8" in length. They are BIG. Any size dog can enjoy these all natural dog treats because they can be broken into smaller bits. I spoiled Shiner a little bit and let her have a whole one for our photo shoot. She was in heaven! They are available in 3 different proteins: Beef, Lamb, and Chicken. Definitely a a super tasty treat for dogs to enjoy this holiday season. These are small dog chews measuring 4.5"-6" in length. They come in packages of two and are made from beef steer pizzle in the shape of a candy cane. They are oven baked, and grown and made in the USA, of course. 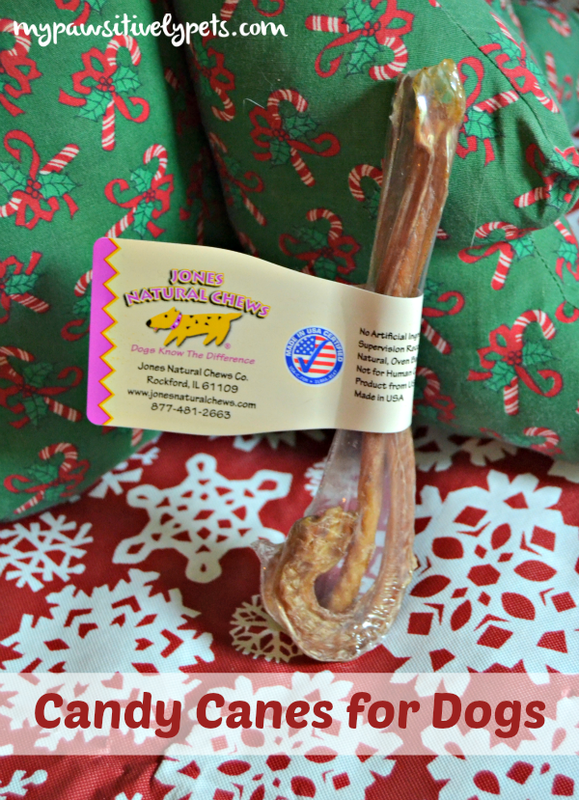 Made to fit in stockings of all sizes, Candy Canes from Jones Natural are the perfect stocking stuffer for dogs. You can stay up to date with Jones Natural Chews on Facebook and Twitter. So, are YOU drooling yet? 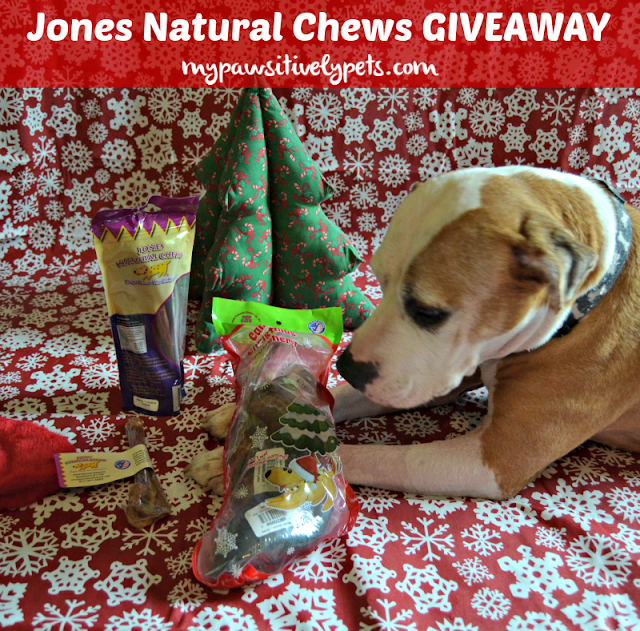 We have a giveaway to share with you from Jones Natural Chews. 15 winners will be selected to receive a sample pack of Jones Natural Chews. This giveaway is open to Continental US Only (void where prohibited by law), ages 18+. This giveaway ends on December 18th, 2015. Just use the Rafflecopter form below to enter. Good luck! My dogs absolutely love chews from Jones! my dog would loveeee these! and they would keep her busy for hours! perfect gift for the winter when we can't go play outside as much. Great gift! Would like to try the center bone, but all of Jones stuff is great. My pup loves to chew! she would love that knee cap! and I love that it is all natural! I purchase a bag of Jones Natural Chew at Tractor Supply for my boys to try! OMD did they love the taste. They had a mix bag and that was the only Jones Natural Chew they carry. Schooner and Skipper gives it a big high five! 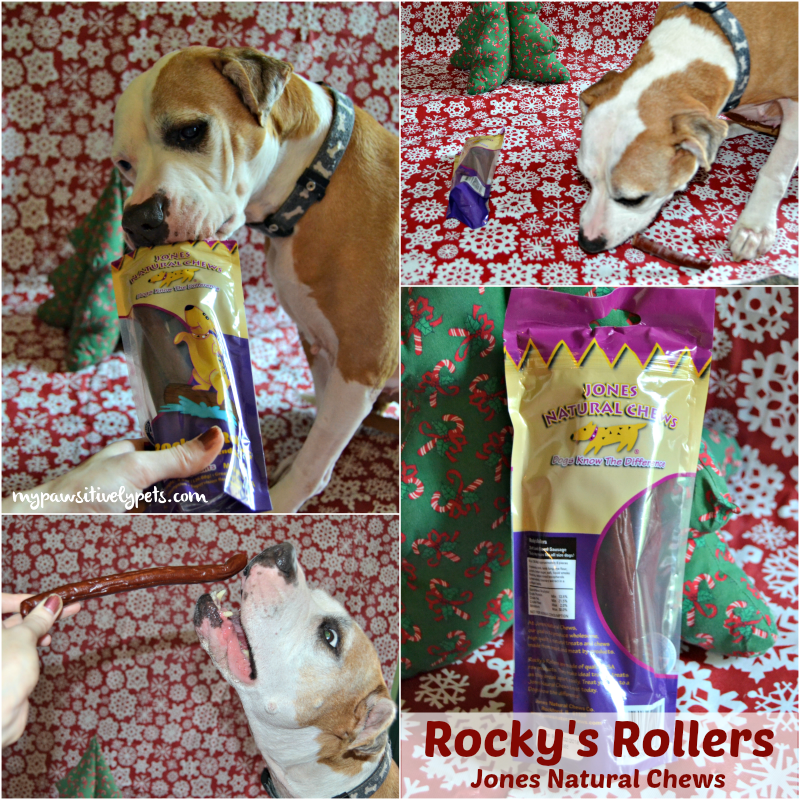 Schooner and Skipper would LOVE to try Rocky's Roller because it look like a fun chew! Schooner and Skipper would love to try the Braided Stix and the Rocky' Roller! My boy Drago loves a good chew to help when he is bored and I am busy. He loves that Jones chews are tasty. Drago loves the braided beef stix or any of the pizzle stix and the chicken links. I have two dogs who love to chew so they would appreciate these. My rottie mix would like to try the Big Paw Jerky! My dog loves the pizzle sticks! Would also like to try the rocky roller! Nice! We always get some good chews for Christmas too! All my dawgs would like to get their paws on these treats. Great to put in their stockings and good for them, too! I would like to get this for my daughter's new puppy. She just a few months old and would love these. I think any of the beef knuckles would be great for a puppy that's teething. Nala loves treats and chews and recently has discovered Jones Natural Chews. Her favorite is lamby links but I thinks she would love Rocky's Rollers. Tasty natural way for my dogs to keep tartar off their teeth. I think my dogs would like the beef knuckle bones. Beauregard loves the Braided and Pizzle sticks. My dog loves treats, these look great! Would be really excited to try the pizzle stick! My dog would love these in his stocking! The rocky roller looks fun! Our dog loves Jones! Would like to try the pizzle stick. Jelly LOVES her chewies, she has enjoyed many lazy hours in her bed with a nice chewie! That is definitely a drool-worthy bones for Shiner! My boys LOVE their Jones bones too.